Richo and I kicked off the long weekend in style a few weeks back. One of the many beers consumed that evening was The Bruery's So Happens It's Tuesday, a monstrous bourbon barrel aged stout that was seriously luscious and packed with roastiness and vanilla. Sky's the Limit (Level 25) was the badge. The next day Dylan and I took our first collaborative steps in the world of home brewing. Being responsible; we decided to stick to low ABV options - at least until the brewing was done. The first level of Riding Steady (Level 34) for the day was unlocked by Hargreaves Hill's new Small Sour Ale, a lightly hopped Berliner Weiss with nice citrus elements. Nomad Rosie's Summer Punch unlocked Ich Bin Ein Berliner (Level 2). I was really surprised that this was only the second level of Ich Bin Ein Berliner that I had unlocked - I'm sure there will be more in the future. It had nice sourness for a Berliner Weiss and was reasonably fruity. however it was lacking in the floral aspect I was expecting from a beer espousing itself as having plenty of hibiscus... A nice summer refresher nonetheless. Riding Steady (Level 35) was unlocked by Nøgne Ø's Strandhogg, a blackberry Gose from these famed Norwegian brewers. This beer I still remember vividly! There was this strange vinous characteristic to the beer that I presume was coming from the tart blackberries. This was accompanied by a distinct pepperiness (again something I'd associate more with red wine) and light salinity befitting it's Gose status. This wasn't mind blowingly good, but it certainly was memorable. The last beer of our brewing session to unlock a badge for me was the Kereru Karengose. This beer gets a bad wrap, but I really quite enjoyed it. It's wonderfully refreshing and has nice light wheat flavours that combine with the salinity really nicely. There's a very faint salty vegetal aroma, which I'm guessing is the seaweed mentioned on the bottle, but it doesn't translate to the palate at all. Drink Like a Kiwi (Level 41) is why you're hearing about it now. One of the reasons this post has blown out a bit is that I was lucky enough to win tickets through the Crafty Cabal to the Good Beer Week Gala trade show. The very first beer I had; Fury & Son Pale Ale unlocked two badges, something of a rarity these days, New Brew Thursday (Level 31) & By the Campfire (Level 10). This one redeemed the brewery in my eyes after the disappointment of their Pilsner recently. This was a nice bitter Pale Ale that I would like to try again in the future. Tallboy & Moose recently opened their Brewpub in Preston, somewhere I've been meaning to get down to! I knew I had to try at least one of their beers and stumped for Honey I Shrunk the North East IPA, a 3.3% New England IPA. It was everything I expected it to be, very cloudy and impressively bitter. You're reading about it because it unlocked Riding Steady (Level 36). I mentioned earlier that I thought there would eventually be a run on of Ich Bin Ein Berliner badges. (Level 3) was unlocked by the much hyped Pirate Life Apricot Berliner Weisse. As I've come to expect with these guys, the beer was excellent! It was quite tart and had plenty of distinctly apricot flavour. I would love them to package this in the future. One of the highlight of the GBW Gala was getting to try some of the rarer Boatrocker offerings. 2X (Level 15) was unlocked by their Coffee Ramjet. It's a pretty huge statement to make, but I believe that this beer may well be leading the race for my Golden Pint awards at this stage of the year! It's such a brilliant stout, which the coffee is just blended into so seamlessly. I found out many things at the Gala but one new piece of information took the cake; 7 Cent have re-released Big 'n Beardy! It's got even bigger since the first release; now clocking in at 10.1%. At this point in time I thought it was still a bit too young, with a little alcohol burn detracting from the wonderful roast, chocolate and caramel flavours. I'd be keen to get my hands on a bottle and review towards the end of winter. The beer unlocked Imperial Czar (Level 6), the badge for drinking Russian Imperial Stouts. Two badges that are almost a certainty to occur every year; St Patrick's Day (2017) & Happy St Patrick's Day from Guinness (2017) were unlocked by a Guinness Draught at P.J. O'Brien's on St. Patrick's Day - funnily enough. As it is every year, the first Guinness on St. Patrick's Day always tastes special. I'm sure all of you know what I'm talking about! There will be far more Guinness talk in my Porter vs Stout post which is nearing its completion. 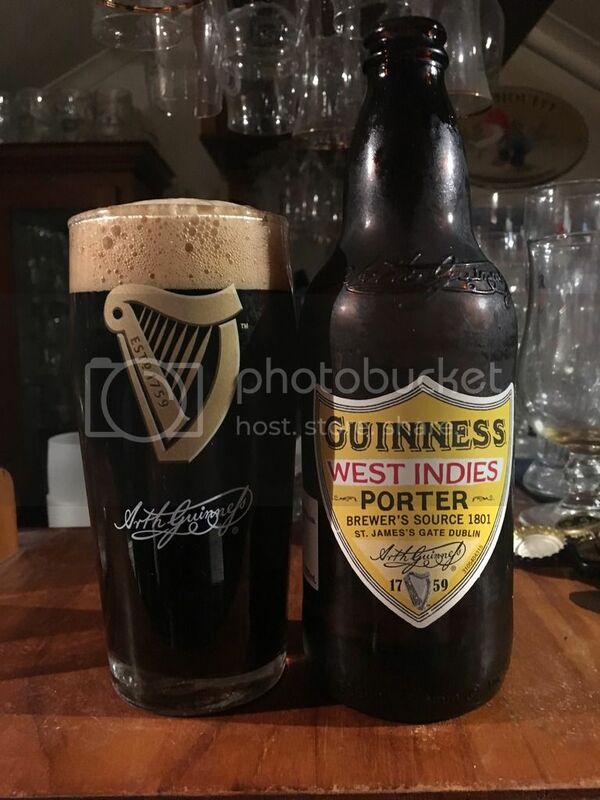 Later that night, for some unknown reason, I decided it would be a good time to try my Guinness West Indies Porter. This happened to unlock a special Guinness badge, Who's Afraid of the Dark, for drinking two different Guinness beers during March. It's pretty similar to the regular Guinness, however it's a bit richer and a bit fuller bodied with a nice hint of licorice on the back end. Moon Dog cop quite a bit of flack, most of it unjustified, for their beers and their propensity to explode from time to time... One from their core range that was launched early last year, Old Mate Pale Ale, unlocked Riding Steady (Level 37). It's quite bitter for a Pale Ale, but the hops provide wonderful flavours of citrus, pine and passionfruit - and is a beer that I'd quite happily session on. Dylan and I ventured to Thornbury and the wonderfully dangerous place that is Carwyn Cellars for KBS Day a couple of weekends ago. With KBS not being tapped until late in the afternoon we had plenty of time to sample some of the other offerings from Founders. Lizard of Koz, a blueberry, chocolate and vanilla Imperial Stout that has been aged in bourbon barrels. Despite the weird assortment of ingredients the beer turned out beautifully, although it was quite sweet and because of that I doubt you could drink more than the 150ml that Dylan and I both consumed. Beer City Brewsader (2017) & Sky's the Limit (Level 26) were both unlocked by this unique beer. Whilst waiting to try two more stouts (KBS 2016 &2017) well over 11% ABV, I decided it'd be a great idea to have a full pot of Ægir's Ratatosk, a 9% Imperial IPA... (In fairness; great at the time - less so the next day...) 2X (Level 16) was unlocked and so were my tastebuds! This was an IIPA heavy on fruit, with nice citrus notes in the background against a back drop of sweetish caramel malts. After a nice Sunday session at the London Tavern for a mates birthday, a few of us decamped to Jimmy Grants on Church St for some souvlaki's. Naturally at any Greek restaurant the beer of choice is Mythos; a beer I haven't had in years! It wasn't awful, with reasonable grain flavour, little sweetness and even a touch of grassy bitterness. What I do know is that it paired beautifully with my souvlaki and also unlocked Riding Steady (Level 38). Lizzie and I popped out for GAMI after seeing a play the other night. GAMI is known for their wonderful Korean Fried Chicken, but they also have a reasonable selection of beers at reasonable prices. The infamous Thunder Road Pacific was the beer that unlocked On a Roll! This is a badge for checking into various types of Asian restaurants. The beer certainly isn't up to the standards of it's namesake from Byron Bay, but it's a perfectly serviceable knockoff. I think after the last 6 or so months I can finally answer one of my most hated questions; who is your favourite brewer? I think the answer has to be the wonderful Danish brewer To Øl - they simply never disappoint! Their DIPA Underground was a beer I had, and really enjoyed, this week and in doing so it unlocked 2X (Level 17). It poured a bit darker than I generally like my Imperial IPA's, but the taste was phenomenal - with near perfect balance between grapefruit hop flavours and biscuity/earthy malts. Levels of the Crisp as Day badge don't roll around all that often anymore. That's why I was pleasantly surprised when Who You Callin' Wussie unlocked (Level 20). Craft Pilsner's are very hard to find - mostly due to the extra fermenter times, and therefore costs, that lagers require. This is brewed by Arrogant Brewing, a subsiduary of Stone, and was a lovely clean Pilsner with plenty of hop bite. If you're looking for a straight up and down American take on a classic Pilsner - look no further! Last but not least was Magic Rock's Inhaler, a Pale Ale x Session IPA that unlocked God Save the Queen (Level 39) & Riding Steady (Level 39). For a hoppy beer that clocked in at only 4.5% the beer had held up pretty well on it's journey over from Huddersfield, England - but I can't help but feel that this would've been a better beer fresher. That said, the hops still packed nice bitterness but the tropical fruit and citrus flavours were a tad muted. So there we have it guys! I've finally got this post up, shame it took me over three weeks between posts! Hopefully a few of the posts that I have in the works will get finished in the next week or so, especially the Porter vs Stout post that I'm particularly excited about. Keep your emails coming through on gus.norris7@gmail.com as I'm almost up to date on them at the moment. Until next time guys!